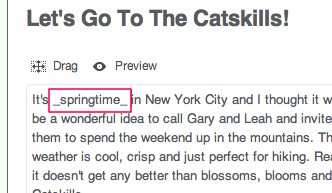 You can make the text in your GoDaddy Email Marketing campaign italic, with a button in your text module. Add a module with a text block, or click in any existing text block. Highlight the text you want to italicize. Click the I at the bottom of the text module. Two underscores will be added to each side of your text. This means that text will be italicized when you preview. 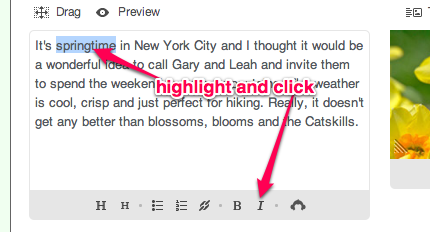 Click the Preview button at the top of the text module. When your campaign is ready, send it to your subscribers.